Looking for a new way to obtain fresh produce? 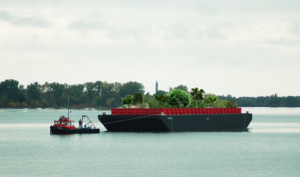 This floating urban forest has your back.Swale, a barge topped with a forest of trees and edible plants, will be docking in Brooklyn, Governors Island and the Bronx this June. Inspired by a late-1800s ordinance forbidding picking or foraging for food on NYC’s public land, Mattingly hopes the project convinces city officials to repeal the law.